Respect for Aged in Japan? Respect the aged day has put the issue of the missing centenarians back in the news. Not surprisingly, Respect for the Aged Day here in Japan had local media focusing once again on the nation’s missing centenarians. The three main dailies almost spoke in unison in describing the uneasiness of showing respect and affection for old people and wishing them long lives (as is the official intention of this day) when so many cases have come to light of old people who can't be traced and of families apparently concealing the demise of relatives in order to keep receiving pension payments. According to recently released government statistics, 8 million Japanese are aged 80 or older, a figure that represents about 6 percent of the total population. Less reliable resident registry records, meanwhile, show that there are 44,449 people aged 100 years or older. But when it comes to the nation’s family register records, the Justice Ministry says there are 234,354 centenarians who are supposed to be alive who can't be traced. A large part of the discrepancy in the family register figures can probably be attributed to chaotic record keeping during World War II. But combined with the cases mentioned above, the nation has been splashed in the face with a glass of cold water when it comes to perceptions of Japan’s respect and care for the aged. Figures in the Asahi Shimbun’s Monday edition showed that the proportion of three-generation households in Japan, which were the perceived cultural norm in the nation, has decreased markedly. While in 1986, 45 percent of households with elderly family members fitted in with this three-generation image, that figure had plunged to 18 percent in 2009, with a larger proportion of these households, 23 percent, comprising elderly people living a solitary existence. In the paper’s editorial, it called on retiring baby boomers, who themselves don't want to be considered aged, to help in efforts to keep track of and offer support to the elderly. This would also make members of the baby boomer generation themselves more willing to ask for and accept help in the future. This is a model that would help rebuild a mindset that respects the aged, it argued. The Mainichi Shimbun called on local authorities not to allow regulations over room size and room sharing to be relaxed at special nursing homes for the aged. Elderly people shouldn't be crammed into rooms to keep costs down and help facilities stay out of the red, it argued. The paper also called for a review of the nursing care system that did not exclude talk of healthcare insurance payments and taxes. For its part, the conservative Yomiuri called not just for renewed recognition of the importance of family relations, but also for the proactive building of ties among people. It also talked of the necessity of revising the resident and family register systems, increasing the sharing of information on the elderly among central and local governments and better coordination between the various parts of the welfare system. Let’s hope then that this jolt from complacency vis-a-vis the elderly leads to renewed awareness of the need to maintain contact with and to help the aged, and for authorities to pay more attention to who and where their senior residents are and the services that they provide them with. 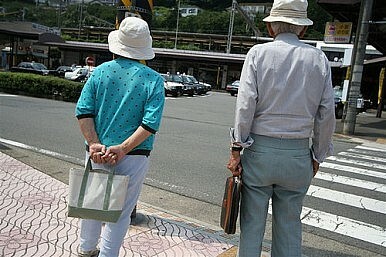 For a society ageing as fast as Japan’s, that surely must be a good thing.